Home / Stock Picks / Stocks to Buy / Should You Buy American Express Stock Before Earnings? 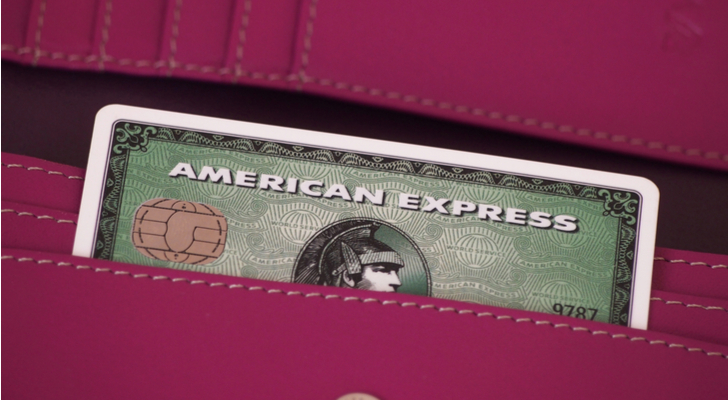 Should You Buy American Express Stock Before Earnings? We’re only a few days into earnings season and so far it’s a mixed bag. Overall, bank earnings aren’t suggesting there was an issue from the consumer side. Those that did poorly were mostly from a result of the Fed or fourth-quarter volatility. That bodes well for credit card companies like American Express (NYSE:AXP). AXP stock will be in the spotlight on Thursday when the company reports its quarterly results after the close. Currently, analysts expect fourth-quarter earnings of $1.80 per share. If AXP hits this mark, it will represent 13.9% year-over-year (YoY) growth. American Express has beat earnings estimates for seven straight quarters. Worth noting, unlike some bank stocks, estimates haven’t come down for AXP. In fact, they have climbed a penny per share over the last 30 days and are flat over the last 90 days. Despite this, the stock has been under pressure. On the revenue front, analysts are calling for sales of $10.56 billion in sales, representing a impressive YoY gain of 19.5%. Short of management providing disappointing guidance, it’s hard to imagine AXP stock falling should the company beat these estimates. Analysts expect American Express to grow sales 20.8% in fiscal 2018 to $40.44 billion. For earnings, they’re looking for $7.38 per share, 25.7% YoY. This leaves AXP stock trading at just over 13 times this year’s earnings. That’s cheaper than both Visa (NYSE:V) and MasterCard (NYSE:MA) — two stocks that I like very much. I like V and MA for their consistency. With AXP, there’s been a few more bumps in the road. Estimates call for a notable deceleration in growth in 2019, but analysts are still looking for positive results. Expectations call for 7.6% sales growth in fiscal 2019 and 10.2% earnings growth. 13 times earnings is reasonable for double-digit earnings growth in 2018 and 2019, and strong sales growth both years. Last quarter, AXP beat top- and bottom-line expectations, raised guidance and expanded its partnership with the fast-growing PayPal (NASDAQ:PYPL). These are things we like to see from a company. From a fundamental perspective, AXP is attractive, although because of its loaning business, it does not operate solely on the “tollbooth” business like Visa and MasterCard. Online spending and holiday shopping was strong last quarter, which bodes well for all the credit card companies. One worry though? Falling gas prices. While lower gas prices is a boon for consumers, it hurts transaction revenue for companies like V, MA and AXP. Let’s see if that impacts the top line this quarter. Shares are up about 10% off the recent lows, as AXP stock has gone from $89 to $98. 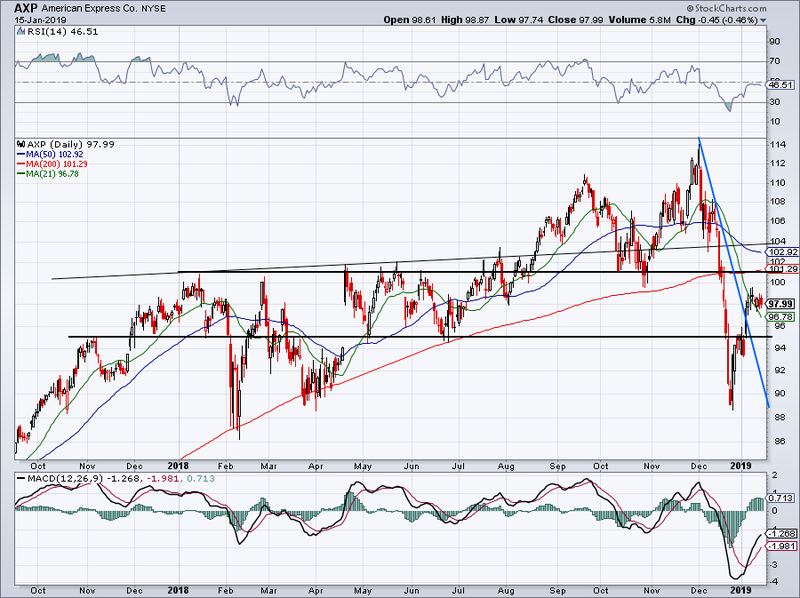 Near $98, American Express stock has been consolidating nicely over the last few days. It’s currently holding up over the 21-day moving average and earnings will decide if the next move is up or down. A reaction to earnings ahead of the announcement is impossible to predict. But we can look at a few key levels to consider. For instance, on the downside, we have the 21-day just below current prices at $96.78. That’s a little too close to expect it to hold as support. However, $95 has been notable and could stand up as support should AXP stock come under pressure. The last line in the sand comes down near $89 to $90. This mark has held up throughout 2018 and I would expect it to now, provided something horrible doesn’t come from the quarter. On the upside, The $100 to $102 level has been significant and may act as resistance going forward. It doesn’t help that the 200-day is at $101 and the 50-day is just under $103. However, a 5% pop would clear AXP stock over all of these levels and make it an enticing post-earnings entry for bulls should the stock close above these levels. Article printed from InvestorPlace Media, https://investorplace.com/2019/01/buy-american-express-axp-stock-before-earnings/.